Many people would like to see ripped abs in the mirror, but not everybody knows how to get them. Learn what changes to make in your diet so you can finally achieve that 6-pack! Ah, the warmer weather is upon us. It's time to wake up from hibernation and uncover those abs! What's that, you say? The snow has melted but your abs are still covered with some winter-time flab? Sounds like you're ready to make some changes to your diet. Endless crunches aren't going to get you what you want. You can exercise all you like, but if you're not eating the right mix of foods, you'll never see that lean, hard tummy. This might sound like a cliche, but I'm going to say it anyway: Abs are made in the kitchen! To make your diet more six-pack-friendly, implement these five changes. They'll help you do the right thing at home so your work in the gym isn't wasted. Although your sodium intake isn't going to have any influence on your body-fat levels, it will make a difference to the way your body regulates water retention. 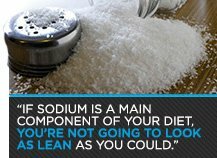 If sodium is a main component of your diet, you're not going to look as lean as you could. Especially if you vary the amount you get each day, high sodium intake will cause your body to retain water. Waking up to that bloated, puffy look is anything but motivating. Although it will be flushed away with the right amount of water, a surplus of sodium in your body doesn't do much for aesthetics. Keep your sodium intake as steady as you can, and watch for hidden sources of sodium in sauces, condiments, and frozen foods. Packaged cereals, baked goods, candy, and other processed carbohydrates cause insulin to be released and blood glucose levels to spike. If the spikes are too high and too frequent, insulin resistance will tend to develop. This entire process will do nothing but encourage faster fat gain—and eventually, perhaps, saddle you with type 2 diabetes. For those who have difficulty managing their hunger, snacking on simple-carb foods will only make it worse. Instead, select whole, complex carbs such as sweet potatoes, brown rice, or quinoa. If you do want to include processed carbs in your diet, limit them to just after you train, when your body is most receptive to dealing with them. Many people, especially those who follow a Paleo lifestyle, avoid all dairy. Although eliminating dairy products is one way to lean down, it's not a necessity. According to a study published by the International Journal of Obesity, low-fat, high-protein dairy products can accelerate abdominal fat burning. The study assessed the total fat loss and lean tissue loss in two groups eating the same amount of calories. The only difference was that one group ate yogurt, while the other did not. Researchers noted both higher fat loss from the trunk region and higher lean muscle mass retention in the group that ate yogurt. When choosing dairy products, be sure to select types that aren't high in calories. If you keep your choices lean to maintain your proper caloric intake, you should see progress. Fiber forms an important part of a healthy diet, helping to offset hunger and slow the release of carbohydrates into your body. However, too much fiber can leave you bloated and feeling gastrointestinal distress. Excessive fiber can also cause your stomach to distend—which makes you look a lot less lean than you are. The Institute of Medicine recommends 38 grams per day for men 50 and younger, and 30 grams for men older than 50. For women, those numbers should be 25 and 21 grams, respectively. If you fall short of those goals, ramp up gradually—say, 5 grams per day at a time. To ensure that you move in the direction you want, you need to regularly assess your progress. If you find that you're not leaning down as quickly or efficiently as you'd like, you may need to cut some calories. Making periodic drops to your calorie intake as you continue to lose weight will be essential to keep progress moving along. Along with these drops, you also need to add periodic cheat meals to help "reset" your body to increase fat loss. A diet that's missing periodic drops and increases is going to plateau. If you make these changes to your winter diet and spend time working hard in the gym, you should begin to see positive changes in your body.